Amid a sea of New Year’s Eve parties, countdowns, and champagne, there’s a celebration that stands out from the crowd. Celebrate Twice in Mexico Beach, Florida, is back for another spectacular day and night of fireworks, live music, and great food upon the beautiful white-sand beaches by the Gulf of Mexico. 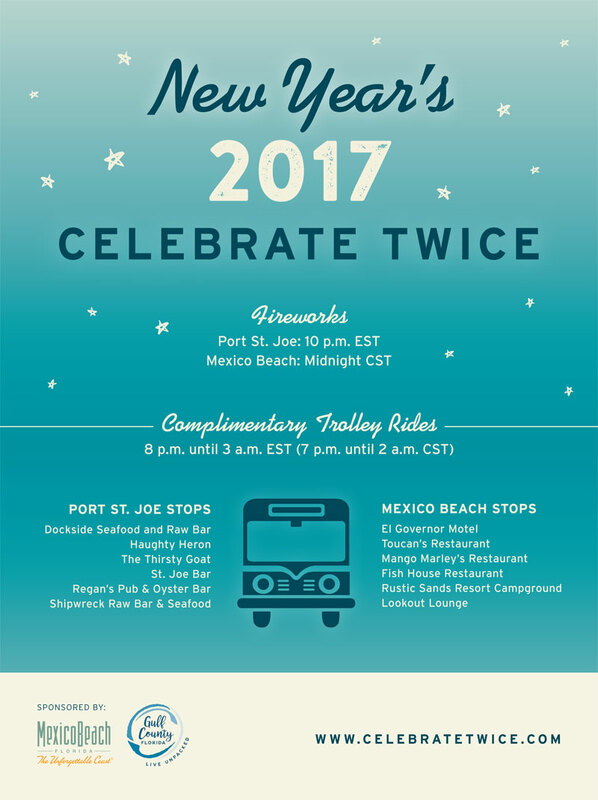 Join the Mexico Beach Community Development Council and the Gulf County Tourist Development Council as they present this unique New Year’s Eve event starting on December 31, 2016. What does “Celebrate Twice” mean? 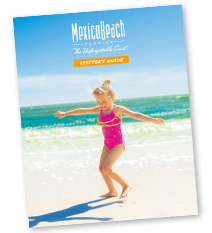 The town of Mexico Beach and its neighboring town of Port St. Joe share a time zone border, giving visitors and locals alike the opportunity to count down to 2017 in the Eastern time zone in Port St. Joe and then take a free trolley just 20 minutes west to Mexico Beach and do it all over again in the Central time zone. The nine free shuttles will run from 7:00 p.m. until 2:00 a.m. CST, stopping at six participating restaurants and bars in each town. These venues will offer live entertainment, cool drinks, and Gulf views as patrons ring in the new year—twice in one night. Daytime events on December 31 include a family-friendly Scavenger Hunt through both towns. Anyone can participate by visiting CelebrateTwice.com to print a free Scavenger Hunt punch card. Visit each of the six businesses listed on the punch card to collect New Year’s Eve party favors. Turn the completed card in to the Mexico Beach Welcome Center or Gulf County Welcome Center by 2:00 p.m. CST on January 1 to enter for a chance to win a gift bag filled with items from Mexico Beach and Port St. Joe! The whole family can also enjoy two spectacular New Year’s Eve fireworks displays. Watch colors and lights burst above Port St. Joe beaches at 10:00 p.m. EST and then again over Mexico Beach at midnight CST. Safety and security are the top priorities of the Mexico Beach CDC and Gulf County TDC during Celebrate Twice; please enjoy the complimentary shuttles! They will stop at these participating locations for Celebrate Twice: Dockside Seafood and Raw Bar, Haughty Heron, the Thirsty Goat, St. Joe Bar, Regan’s Pub and Oyster Bar, and Shipwreck Raw Bar in Port St. Joe, and the El Governor Motel, Toucan’s, Mango Marley’s, Fish House Restaurant, Castaways Southern Cuisine, Rustic Sands Resort Campground, and Lookout Lounge in Mexico Beach.